Easter, this year, began for me at Christmas Tide. The birth of a child to a teenage mother is a familiar story at Christmas. But the family trauma that resulted from my personal story, I had long buried. And these forty-five year old memories resurrected a trembling seventeen year old child. The very next day, December 12th, scared to death, I called my newfound child. It was the best Christmas present I have ever been given. Her name is Rebecca. And resurrection has brought reunion. It is remarkable how deeply Rebecca and I resemble one another: our personalities, our intellectual curiosity, our spiritual bent, our sense of humor. Not only our way of speaking but what we say. People have confused my writing for hers and her writing for mine. It is uncanny. It is remarkable. Rebecca says that distance reinforced her DNA. It was a form of rebellion, she says. I do like the sound of that, though I am not sure exactly what it means. Needless to say, this has been an incredibly healing experience. Sprouted from the same soil, Rebecca and I, our selves, our souls, and our bodies are intertwined. Now the green blade riseth! indeed! So it seems very apropos to post Dirt Therapy once again. A post that includes an anecdote about Jacob, Rebecca’s newly discovered little brother and a snapshot of my mother, the grandmother Rebecca never knew. It wasn’t exactly “Now the green blade riseth” but it was sweet indeed. That sweet little boy was my son Jacob (now 29 years old!). Sadly the little Jesus vine did not survive very long — but don’t blame Jacob. Sadly, you see, plants often came home to my house to die. Categories: mental health, relationships, spirituality | Tags: "Now the green blade riseth", Adoption, Ancestry.com, Bipolar Brain, Christmas, DNA, Easter, gardening, Genetics, Resurrection, reunion, teenage preganancy | Permalink. Impatience, thy name was Dr. Peacock. When I was growing up, my father, a busy and successful surgeon, did not like to wait. He would not take us anywhere he anticipated crowds or lines. He would never go to a restaurant without a reservation. When we went to the movies, we went at odd times, arriving late, sitting in the back and leaving early. Native Washingtonians, we never visited the White House or the Washington Monument. We never went to the Cherry Blossom Festival or the lighting of the National Christmas Tree. No time to be patient, beloved, no time to be patient..
Now most us, including myself, much like my dad, count waiting as a colossal waste of time. And via the bazillion apps on our iPhones, iPads, and MACs, we need only navigate the net to have an instant Christmas. UPS and Federal Express or a guy on a Segue from Amazon Prime will deliver to your doorstop a complete Christmas, from soup to nuts: the tree, the trimmings, the trappings, the presents and all the wrappings. Cyber-Monday, Cyber-Everyday eliminates the wait and takes us far from the maddening crowds. Awesome Sauce! Right? Convenient for lives and calendars crammed with business appointments, committee meetings, carpools, school concerts errands and chores. This is something close to a f*ing miracle! Successful people know that time is money — more precious than money. Waiting is for chumps, for the clueless, for losers. Waiting is for crazy people, waiting on the end of the world – with a specific date and time in mind for Jesus to return: survivalists stockpiling food, water, and toilet paper. Only wacky Millennialists wait on the impossible. Only wacky people wait on the mountain top for the space ship to come pick them up, beam them aboard, and fly them off to who knows where. Waiting on doomsday. Waiting for the end to come. Jesus promised he would be back. He said he would be back. So they kept vigil and they waited and they watched the skies and they yearned and they longed and they pined. Be patient, beloved, be patient. Now, patience is a virtue and sometimes the wait is worthwhile. Sometimes hanging in there is indeed worth it. After all, what is grape juice compared to a fine wine? What are Cliff Notes compared to the plot twists of your favorite book? What is a cheap and tawdry affair compared to a life long love? Waiting cultivates desire, illuminates our need and heightens our expectations. And in the end, waiting sharpens our pain, as well as, our joy. The people of Saint Paul’s in Rome were not just idly waiting. They weren’t just biding their time for something better to come along. They were waiting for a taste of heaven. They were waiting on eternity. Something like a Christmas came and something like a Christmas went, year after year, generation after generation. And the folks at Saint Paul’s began to feel a little silly, a little self-conscious. And these folks, they grew plain sick and tired of waiting. And Christians everywhere, it seemed, lost the will to wait. When Jesus did not come riding in on the clouds, like a shining knight on a white horse, as he was long expected to, we just gave up on waiting. It’s naïve, a childish thing, beyond belief. So instead, we now wait just four weeks for the baby in the manger. We wait just four weeks for the Jesus who has already come. And yet, anyone who has been through the nine months of pregnancy, or lived with someone who has, knows that birthing a baby is much more than a waiting game. Who is this little one coming, who has turned you inside out? Who is this little one coming, who will turn the world upside down? Just like the people, two millennia ago, we are waiting on this little scrap of eternity, a little taste of heaven. In this pregnant season of Advent, let us pray, that the Spirit’s seed be planted in our souls. In this pregnant season of Advent, let us pray, that in the darkness of our hearts, this love take root. Christ be born — flesh of our flesh, bone of our bone into this broken, beat up, and battered world that cries out for the love of God so loudly. Categories: spirituality, Spirituality and Mental Health | Tags: "Invasion of the Body Snatchers", Advent, Christmas, Impatience, Isaiah 11, Pregnancy, Saint Paul's Letter to the Romans, Second Coming | Permalink. We got all dressed up to go Woodies. 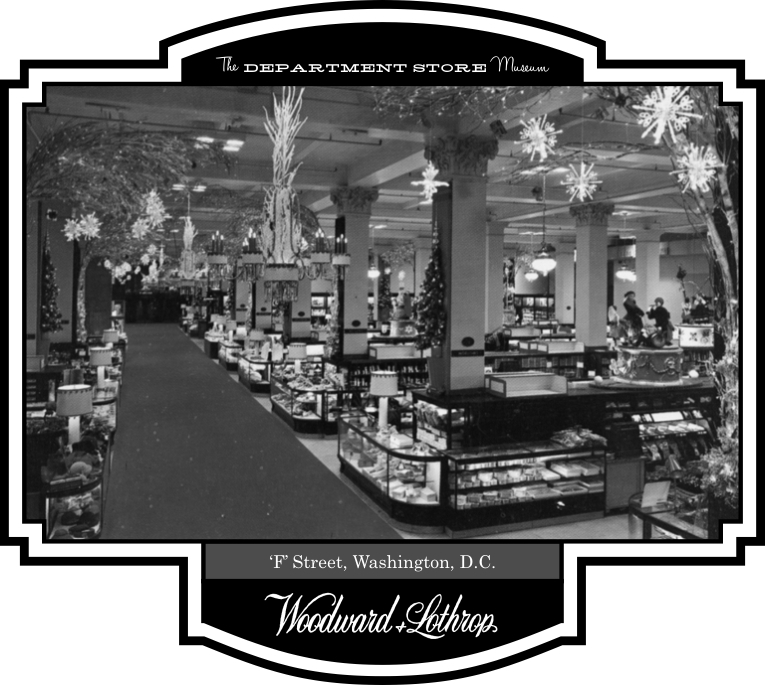 At Christmas, my mom would get us all dressed up to go shopping downtown in D.C. As a kid, this little corner of Washington was a wonderland to me. I remember pressing my nose up against the department store windows – bedazzled by animatronic snowflakes, snowmen, and Nativity scenes. We’d go to lunch in the tearoom where we got to sit on Santa’s lap. We’d ride the elevator to every floor and at every stop — notions or housewares or lingerie — all of the clerks greeted my mother by name. At Garfinkels, Woodies, and Hechts she would charge up her Washington Shopping Plate. It was Christmas after all – time to load up on socks, mittens, and gloves. Time to splurge on fancy talcum powder and Christmas cologne, pierced earrings and cultured pearls, Instamatic cameras and baseball bats. “Put it on my account,” she would say. In my teenage years, my mom converted to catalogs. Long before online shopping or the Home Shopping Network, Christmas catalogs clogged our mailbox. I remember them being piled high in a basket in the family room by the couch. And I can see my mom sitting there — clear as day – leafing through them: LL Bean, Orvis, Land’s End, Sharper Image, Harry & David’s Fruit of the Month Club. Armed with just a telephone and a credit card, my mom would shop until she dropped. Sometimes she would buy so much stuff, she would forget that she had bought it and buy it again. Sometimes she bought so much stuff, she would hide it in the attic or the trunk of her car. She would bring it in little by little – hoping that my father would not see. Until the bills came, of course, and the sh*t hit the fan and my father hit the roof. We always got tangerines and toothbrushes in our stockings – but it was the stuff under the tree that was the measure of my mom’s moods. Unwrap a box and you would peek into her soul: bright on the outside, dark and disorganized on the inside. One year she did all of her shopping at the drug store. She gave me a man’s thermal undershirt, a meat thermometer, and hot pads. Another year she did all of her shopping at the country club pro shop. I got golf balls, a golf glove, and a yellow sweater embroidered with golf clubs and putting greens. I do not play golf. I have never played golf. It did not compute. And that’s the point. A manic-depressive mind has no use for math. Bipolar brains are no good at budgets. That would require calculated decisions, measured judgment, and impulse control. Such minds have no concept of living within one’s means. In my married years, I abdicated all my financial responsibilities to my skinflint ex-husband. I was the breadwinner and he was the stay-at-home dad. I made the lion’s share of the money but he managed it. He did all of the grocery shopping which was a blessing. He bought everything on sale including cornflakes and he would not buy a new box until the very last flake was eaten. It wasn’t’ until I was on sabbatical in 1999 that I had my very own checkbook — for the very first time. I was 45 years old. Now my money was mine to manage. A middle child, I sought to drive a middle course. But I am not a very good driver; I am my mother’s child. My finances too can be tracked by my moods – or is it the other way around? In my dazzling days, I have charged up my credit cards. In my dark days, I have neglected to pay my taxes. Where your treasure is, there your heart will be. I am embarrassed to bear this broken part of my bipolar soul. And I have worked very hard — for years — to balance this part of my brain. My car is paid for. I am on an all cash diet. I use a debit card whenever I can. I pull out my credit card only in emergencies. Honestly, I still struggle daily to live within my means – especially at Christmas – so many shiny things to stuff into stockings and pile high beneath the tree. So today as I write – on Black Friday — I am doing my best to sit on my wallet. On Cyber Monday, I will try to stay off of my Mac. And on Giving Tuesday, I will try to be as generous as I can without going into debt. After all – generosity — is the reason for the season, right? At Christmas we celebrate the Holy One, born poor in a stable; the Holy One, homeless with no place to lay his head; the Holy One who preached good news to the poor; good news for those dirty shepherds who worked the late shift and watched their flocks by night. He scatters the proud in the imagination of their hearts. the rich be sends empty away. Categories: Spirituality and Mental Health | Tags: Black Friday, Christmas, Cyber Monday, Garfinkels, Giving Tuesday, Hechts, Mania, Money, Shopping, Woodies | Permalink.